CAPE CANAVERAL, Florida (AP) ― Scientists have uncovered a vast ocean beneath the icy surface of Saturn’s little moon Enceladus. Italian and American researchers made the discovery using Cassini, a NASA-European spacecraft still exploring Saturn and its rings 17 years after its launch from Cape Canaveral. This new ocean of liquid water ― as big as or even bigger than North America’s Lake Superior ― is centered at the south pole of Enceladus and could encompass much if not most of the moon. Enceladus is about 499 kilometers across. The data do not show if the ocean extends to the north pole, said the lead researcher, Luciano Iess of Sapienza University of Rome. At the very least, it’s a regional sea some 40 kilometers deep under miles-thick ice. On Earth, it would stretch from our South Pole up to New Zealand ― at the very least. Cassini’s rudimentary instruments also cannot determine whether the moon’s ocean harbors any form of life. Another mission using more sophisticated instruments is needed to make that search. This latest discovery makes the interior of Enceladus “a very attractive potential place to look for life,” said Cornell University planetary scientist Jonathan Lunine, who took part in the study. Back in 2005, Cassini detected a plume streaming from cracks in the south polar region. Scientists suspected these jets of salty water vapor and ice ― containing some light organic molecules like methane ― might come from a subsurface ocean. They confirmed its presence. Their findings appear in the journal Science. 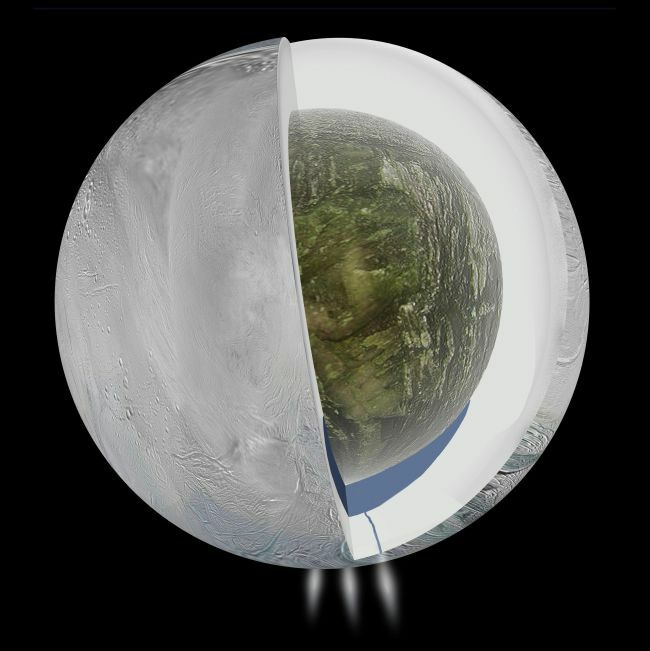 Cassini provided gravity measurements from three close fly-bys of Enceladus from 2010 to 2012. The Doppler data indicated a dense material beneath the surface of the south pole, most likely liquid water. The ocean is believed to be sandwiched between miles of surface ice and a rocky core. Enceladus is hardly the only moon in the solar system with a subsurface sea. Titan is believed to have a global ocean. Evidence points to oceans inside the giant Jupiter moons of Callisto and Ganymede. And Jupiter’s Europa also has a hidden reservoir similar to that of Enceladus, complete with plumes and a rocky bottom.